Chow what? You heard me right, chowTUT! When I first heard of this word I thought, chow as in a meal and tut as in censored where you’re suppose to insert profanities here. So what is there to swear about food? Oh my, trust me, after the chowtut session, you would start swearing too, for being condemned to your chair permanently, or at least for a significant amount of time. So the very lucky people of the Integricity, would have a quarterly chowtut on good foods from various, and various is by the meaning of nearly all over Klang Valley, in one place – their office. How is that? Early before the traffic of long Friday lunches are out in our lazy Malaysian afternoon, few designated employees don their sunglasses, zip up their jackets and rev up their super bikes (exaggeration alerted), and zoom off to their respective assignments of various eateries, from nearby Uptown to TTDI to Bangsar and all the way to the heart of KL – Tengkat Tong Shin and also span out to even Batu Caves, just to pack their said important orders and then brace the starting-to-form-traffic back to the office. After that scene I was stuck. You see, this tham jiak here took for granted that she could reach the food haven in 30 minutes (she forgot it’s a Malaysian Friday!) and so she had to crawl through the traffic, staying cool with promises to self of many good food to come. She was already forming the heart-stopping-artery-clogging spread of food in her mind and boy, when she arrived, she found herself reliving her imaginations, albeit a bit massacred. You see, upon arriving fashionably late of 30 minutes, the wonderful spread has already been butchered to near oblivion, so no acceptable pictures could be captured but fret not (pun intended), her trusted friend Frat shall supply her with drool-worthy pictures, taken by him plus stolen from his friend, Nigel. Without further hesitation, tham jiak threw her belonging away and start digging in, before all there was nothing left! Somebody whispered behind her ear “you got to get the char siew, it is reaallllyy good, and it is nearly finished!”. A hand from somewhere, just like an angel, points towards the said precious meats. She zoomed right on it and grabbed a few, nearly all but conscience got the better of her, then she bit into the juicy meat and she was at a sudden revelation – the feast had finally begun! Next on her plate was this unassuming looking noodle, but not to be misled by its looks, it was really more-ish kind of tasty! 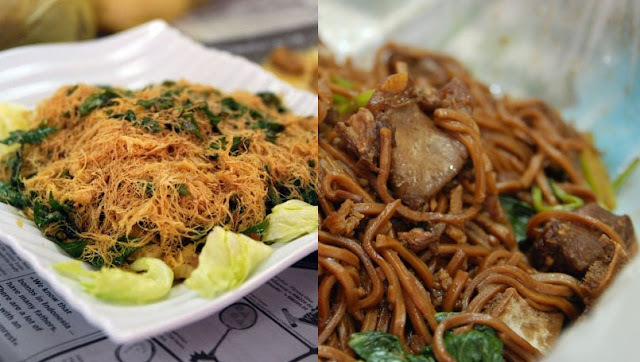 The mee mamak was special in its way, sort of fried with a Chinese flare but in a good way. Then on the other hand there was the undisputable Sang Har Hor Fun, with huge freshwater prawns on top of soupy flat rice noodles, it was as good as it looks, on contrary you can judge this book by its cover! Time to head all the way to Batu Caves for lunch one of these days! Maybe on another long lazy Friday lunch, any takers? While deciding to pour more good stuff onto the plate or not, tham jiak just had to sit down and start devouring first. Then suddenly she saw right in front of her, the golden buttery squid, she just had to poke one and put it into her mouth, and oh my, was it good – crispy then chewy at the same time all creamy and buttery, ah, such bliss. Also from this restaurant that she have blogged before was the fried pork yee mee (egg noodles), which tasted sinfully good, just slightly on bitter side though. Then she saw Jek, who is happily biting on his deep fried chicken, the tham jiak just had to have one too! She had these before, nicely fried with secret (as she cannot name what are they, she just know their good) spices and was glad to have them again in free-flow sort of way. She ate one. Finished everything else, and took another one again. Then she rested, or rather her tummy did, and then she had another one of these. Yes, it was that addictive! Then finally, she stood up from the remnants of her food on the plate to go get the rest of the soupy goodness. She found a cute orange bowl, thankfully, and heads on to get her fair share of our very own famous Malaysian dish – bak kut teh. Ah, as FBB say, can’t go wrong with this one from Teluk Pulai, and also thanks to boo for going all the way to get it and then even sponsor it! Some say she had just bought a permanent ticket to all future chowtuts at Integricity, I better think of my ticket for the next one, wouldn’t want to miss it! Last but not least, some sweetness to end a meal (or was it multiple meals in one sitting? ), there were doughnuts! Though she would love to have the chocolatey creamy one that Jek ate or rather lap up, those were so popular she was just left with either the plain or the chocolate glaze, she had to go for chocolate, you know her the chocoholic! Oh yes, that is Frat with the doughnuts, she suspected he was guarding the chocolatey creamy ones for his master Jek, ah he forgot about her on this one! Maybe this can be an excuse for tham jiak to make him give her a ticket for the next chowtut. Now after having a session of her first chowtut, this tham jiak totally understand now the meaning of “An excessive dose, especially of food or alcoholic beverage” and totally up for the next round of chowtut!